February is here! Wow, that came fast. I can't believe how quickly January flew by. Was that just me or did it go by fast for anyone else? Well seeing as February is the month of love I hope to share with you all a few Valentines goodies. Last year I shared with you all a printable I put together so I thought I'd do it again this year. No, I didn't create the awesome clip-art you see on the card, some lovely talented ladies did, but I did put them together to make this card to share with you all, which I think turned out pretty awesome. 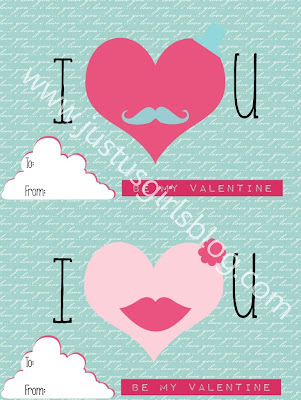 Out of all the Valentine's Day clip-art I've collected over the last couple of years, my daughter got a kick out of the hearts with the mustache and the lips and to be honest so did I. I hope you do too! Please feel free to click on the image above and print these out for your little ones to hand out or maybe you can hand them out to someone you love. Happy First of February!